Off Kilter. Photo by Shawn Theodore. Philadelphia-based artist Shawn Theodore walks us through his stunning solo exhibition, "Church of Broken Pieces." 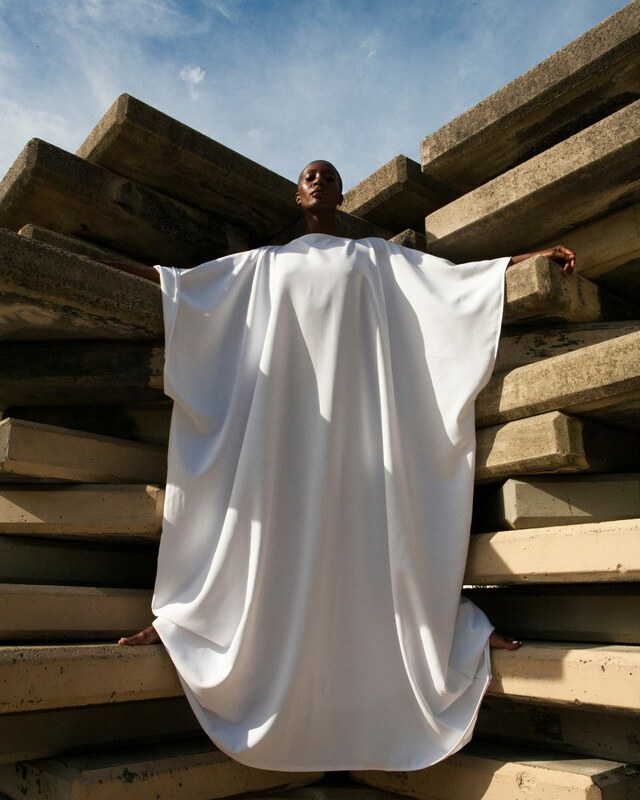 Church of Broken Pieces is a photo series by Philadelphia-based artist, Shawn Theodore, that celebrates the African diaspora in mysterious and dynamic ways. The series recently wrapped up its exhibition at Richard Beavers Gallery in Brooklyn, where he wanted to envision the connection the black community has with spirit through breathtaking images. As Theodore began to research and conceptualize this series in 2012, he realized that the African American community lacks a real throughline of mythology. He knew he was onto something and sought to work in a space where his questions of exploration live in the 'because of' space, instead of the 'what if' space that you'll find in Afrofuturist art. Each photo of Church of Broken Pieces is an interwoven narrative of the cycle of black life. Theodore takes your hand and leads you into a new spiritual world of black boy joy, black women magic—and even pain and death. The minimalism creates of sense of calm as he plays on his strength of utilizing natural light and shadow to fill your eyes with rich color. Click on the slideshow to see Theodore's in depth commentary on eight of his favorite pieces in the series underneath. "For each project, I start off with an entryway piece. One of my main things that I love to do is find places in our neighborhoods that are monumental in scope, or size or design, but largely ignored. These are power centers that just don't have any meaning because—what are we doing with them? This piece was the first piece I shot for the entire body of work. I knew of this gigantic thing in the neighborhood, this is actually about a half mile from where I live, and it's [made of] project steps. When they were making the projects they didn't want to take the project steps back with them, so they decided to just make some sort of ad-hoc art. It's a monstrosity—it's huge. But when I started to take a look at it, from different angles, it started to really had this beautiful, sort of opening quality to it. I had an idea of what my African American heaven would look like, it would be a Jenga-like opening, and it would borrow so much from the architecture and style of West Africa. I thought this was a good way to start this because we start from one door of no return, and here we have a door that, allows you into this world—this spiritual sensibility of what's happening. That's where I started, and I'm kind of proud of it." Keep up with him via his website and on Instagram.